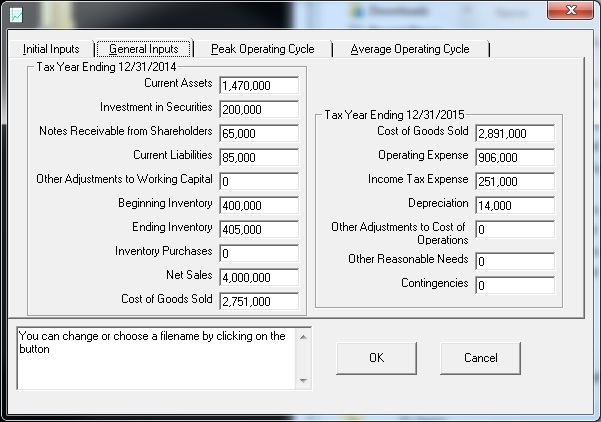 Use the Bardahl Formula Calculator to avoid and defend against Accumulated Earnings Tax. Download the program now! Only $199. We have noticed an increase in IRS examinations of C Corporations. On the IRS examiner's checklist is a question to consider Accumulated Tax. If the C Corp has more than $250,000 in accumulated taxable income, you can expect to fight with the IRS on this issue. This would be a very expensive fight to lose on! "I recently purchased your Bardahl Formula while involved in a corporate audit with an IRS auditor who was very aggressive and had his own interpretation of the case and formula. I used your program and your excellent technical support back-up to prove up our position which saved the client an assessment for accumulated earnings tax in excess of $260,000." "Our client has a potential $3.5 mil. §531 tax. Used your soft. Peak Op. Method. The IRS agent was p_____ off. He is now auditing $2,400 T&E!" See actual note. "It saved my client a lot of money and made me look good." Also purchased by the Canada Revenue Agency! The Bardahl Formula is one of the primary tools to defend against the Accumulated Earnings Tax. The Accumulated Earnings Tax, I.R.C. Section 531, for being profitable and not paying a sufficient level of dividends. The Accumulated Earnings Tax is more like a penalty since it is assessed by the IRS often years after the income tax return was filed. The Accumulated Earnings Tax is computed by multiplying the Accumulated Taxable Income (IRC Section 535) by 20%. Accumulated Earnings Tax can be reduced by reducing Accumulated Taxable Income. IRC Section 535(c)(1) provides that reasonable needs of the business may be used to reduce Accumulated Taxable Income. The Bardahl Formula can be used objectively determine what the reasonable needs of the business are for the business cycle. The business cycle begins when inventory is received and ends when the accounts receivable for the sale of the finished product is collected. This computer program is more than just a Bardahl Formula worksheet. It is both user friendly and powerful. The Bardahl Formula Calculator has been used to defeat the IRS. The Bardahl Formula has two variations, the Bardahl Formula - Peak Method and the Bardahl Formula - Average Method. The Bardahl Formula - Peak Method was first computed in the Tax Court decision for Bardahl Manufacturing Corp. v. Comr. The Peak Method looks at the longest business cycle during the year. This variation of the Bardahl Formula usually gives the best results to the taxpayer. The Peak Method is also more time consuming to analyze. The Bardahl Formula - Average Method was first computed in the Tax Court decision for Empire Steel Castings v. Comr. The Bardahl Formula - Average Method is also known as the Bardahl Formula as modified by Empire Steel Castings. The Average Method is easier and faster to computer than the Peak Method, but the Average Method is not as favorable for the taxpayer. What strategy should a tax professional use when the Accumulated Earnings Tax is either a possibility or has actually been assessed? Compute the Bardahl Formula - Average Method since it is the easiest to compute. If the Bardahl Formula - Average Method indicates that an Accumulated Earnings Tax problem may exist, compute the Bardahl Formula - Average Method. The Bardahl Formula Calculator will calculate the Bardahl Formula - Average Method and/or the Bardahl Formula - Peak Method for you. This program is also helpful in determining what information is needed to make the computation. The Bardahl Formula Calculator only takes seconds to run. This computation by hand could easily take three hours. Download the demo, dbar1410.exe, for this program. The "Bardahl Formula" is a play on words! Bardahl Manufacturing's primary product was an automotive oil additive called the Bardahl Formula. When the Tax Court wrote the decision for Bardahl Manufacturing Corp v. Comr., they invented a formula to determine working capital needed for a business cycle. That formula is known as the "Bardahl Formula".